A popular vacation accessory, such as an RV, is almost a necessity for residents who live in Redlands. RV laws, however, can keep residents from storing their RVs in their driveway or on city streets between vacations. In order to stay within the city legalities, many RV owners turn to self-storage facilities that can offer them the ability to park their vehicle at an off-site location. While many opt for outdoor storage, there are benefits to indoor RV parking, such as that available at Vines Storage. 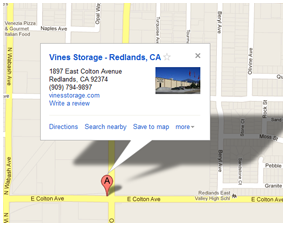 Vines Storage in Redlands, California offers indoor storage for your recreational vehicle. Why indoor storage? There are a number of benefits to opting for indoor storage facilities. First off, your vehicle will be offered the best in protection. Leaving an RV outside can leave it susceptible to the elements, which can damage the exterior of your RV. Sun can result in permanent damage to the paint and metals, so indoor storage can ensure that the paint won't fade and the exterior weather seals don’t harden and crack. Second, indoor RV storage offers a level of security that no other facilities can provide. Vines Storage offers locked, indoor storage, and a variety of security cameras strategically placed in the facility to assist in looking after your vacation investments. We have staff that can monitor the units and protect your material goods. Third, indoor RV storage offers owners the chance to maintain their vehicles over short term or long-term storage. When RVs are left outside in the elements, bugs, and rodents can make the RV their new home. By keeping the RV indoors, RV owners can maintain their vehicle and address issues with their vehicle quickly and easily with convenient access hours. Redlands RV laws keep many individuals from storing their RV on their personal property. By considering Vines Storage to park your vehicle, you can rest easy knowing that your investment is protected, secure, and is maintained within the area's legal limits. Indoor RV parking is affordable and easy with Vines Storage. Call today to receive your quote for self-storage at our large warehouse facility in Redlands, California.